To facilitate corporate growth with enlightened regulation. The Ministry is primarily concerned with administration of the Companies Act, 1956, other allied Acts and rules & regulations framed there-under mainly for regulating the functioning of the corporate sector in accordance with law. The Ministry is also responsible for administering the Competition Act, 2002 which will eventually replace the Monopolies and Restrictive Trade Practices Act, 1969 under which the Monopolies and Restrictive Trade Practices Commission(MRTPC) is functioning. 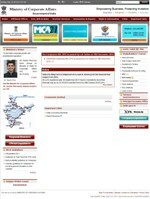 Besides, it exercises supervision over the three professional bodies, namely, Institute of Chartered Accountants of India(ICAI), Institute of Company Secretaries of India(ICSI) and the Institute of Cost and Works Accountants of India (ICWAI) which are constituted under three separate Acts of the Parliament for proper and orderly growth of the professions concerned. The Ministry also has the responsibility of carrying out the functions of the Central Government relating to administration of Partnership Act, 1932, the Companies (Donations to National Funds) Act, 1951 and Societies Registration Act, 1980. On line delivery of all registry related services with speed, certainty and transparency, access to public information and effectively monitoring of statutory compliance by the companies. Effective enforcement of `Companies Act' and other Acts coming under the domain of MCA for better Corporate Regulation and Governance. Protection of Investor and Promotion of Investor Education and Awareness for growth of Corporate Sector in the country. To develop capacity building and secure policy advisory support through IICA. Improving the functioning of Official Liquidators through application of e-Governance. Developing and strengthening capabilities in SFIO.